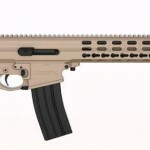 Not all shooters have fingers as short as mine, however the majority must still struggle with the magazine release on the SIG Sauer SIG556, FN FNC, and Robinson Armament M96. With the former you can now opt for the US made SIG551A1 model with a mag-lever akin to an AKM. While investigating whether I could use an AR15 extended magazine release button on an FNC, assuming I could drill it for a roll pin and have it fit, I discovered a solution for the latter M96. 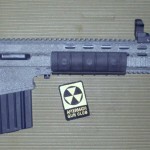 Matt Domoradzki at Atlas Armament, LLC (Facebook) designed the M96 button and was selling it for only $26.00 shipped. Knowing it would be worth the expense, even if it didn’t work out for me, I ordered one immediately. Special parts for esoteric guns, such as this is, are not extremely common. I often take what I can get. In this case, the item was better than expected. The removal and installation was simple enough: Remove the hex bolt, remove the button, insert new button, add lock-tite (optional), and re-install bolt screw. I was recently at the RobArm facility with my rifle; I caught a senior employee taking a close look at the button. He asked where I got it, and replied to my answer, not looking up, “I like it”. The button has machined lines that make a positive connection possible by feel, even when wearing light gloves. As you can see, the mounting point is far forward of where many fingers will actually reach. I was a little concerned that the magazine would not easily drop free, due to shape, as the force on the button is towards the rear. This was easily tested and is in no way a hindrance. The replacement works mechanically as well as the original with much improved ergonomics. I no longer need to adjust my right hand to reach the button, allowing me to keep the palm in the same place through a magazine swap. Unless you are left handed, I highly recommend this upgrade for you existing Robinson M96 owners. 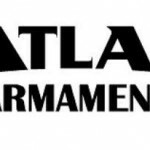 Atlas Armament’s website is currently a placeholder only, and while they do sell on GunBroker.com you can also buy direct from their online store. Email Atlas Armament, LLC direct at atlasarmament@gmail.com for details. Robinson Armament M96 Recon with stock magazine release button.